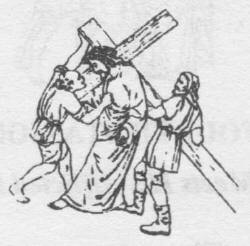 The Cyrenian Helps Jesus to Carry His Cross. Consider how the Jews, seeing that at each step, Jesus from weakness, was on the point of expiring, and fearing that He would die on the way, when they wished Him to die the ignominious death of the Cross, constrained Simon, the Cyrenian, to carry the Cross behind our Lord. My most beloved Jesus I will not refuse the Cross as the Cyrenian did; I accept it�I embrace it. I accept in particular the death Thou has destined for me, with all the pains which may accompany it; I unite to it Thy death�I offer it to Thee. 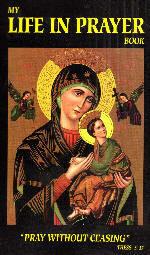 Thou hast died for love of me; I will die for love of Thee, and to please Thee. Help me by Thy grace. I love Thee, Jesus my love; I repent of having offended Thee. Never permit me to offend Thee again. Grant that I may love Thee, and then do with me what Thou wilt.